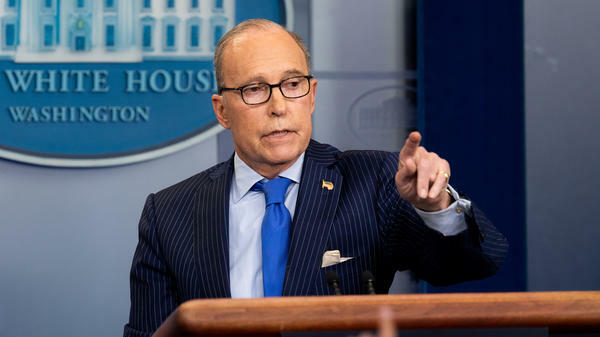 Larry Kudlow, director of the United States National Economic Council, speaks to reporters in the White House Press Briefing room. He justified President Trump's decision to drop out of a joint statement made by G-7 countries this weekend. "Canada does not believe that ad hominem attacks are a particularly appropriate or useful way to conduct our relations with other countries," said Canadian foreign affairs minister Chrystia Freeland, according to the Toronto Star. The foreign affairs minister spoke to reporters in Ottawa and offered a markedly different tone from the attacks lobbed at Canada, one of the United States' closest allies, this weekend by President Trump and other members of his administration. Tensions have been building between the two countries for months, as President Trump has targeted Canada as one of the many countries he sees as giving American the short end of the stick in trade deals. Trump announced yesterday he was backing out of a joint statement made by the countries that attended this weekend's G-7 Summit in Canada, after Trudeau gave a press conference in which he said Canada planned to retaliate against the Trump administration's recently-announced tariffs that will commence July 1. "I have made it clear to [President Trump] that it is not something we relish doing, but it is something that we absolutely will do," Trudeau said. "Canadians — we're polite, we're reasonable — but we also will not be pushed around." Larry Kudlow, who is the director of the National Economic Council, appeared Sunday on CNN's State of the Union to defend Trump's decision to back out of the joint communique made at the end of the summit. The statement was a declaration of shared values and goals by the seven countries — the United States, Canada, Britain, France, Italy, Germany and Japan — that attended. "[Trudeau] really kind of stabbed us in the back," Kudlow said. "He did a whole disservice to the whole G-7." In a tweet posted Saturday evening, Trump said his decision to rescind support for the statement was based on "false statements" made by Trudeau during a press conference he gave, as well as "the fact that Canada is charging massive Tariffs" on U.S. companies. On Fox News Sunday, White House Director of Trade Policy Peter Navarro also defended the president with adversarial language. "There's a special place in hell for any foreign leader that engages in bad faith diplomacy with President Donald J. Trump and then tries to stab him in the back on the way out the door," Navarro said. "And that's what bad faith Justin Trudeau did with that stunt press conference. That's what weak, dishonest Justin Trudeau did. And that comes right from Air Force One." Trump left Quebec before the G-7 summit had ended to head to Singapore, ahead of a highly anticipated meeting with North Korean leader Kim Jong Un, a longtime foe of the United States. Kudlow said on CNN that Trump's reaction to Trudeau's comments has been "in large part" because he does not want "any show of weakness" ahead of that meeting. "Kim must not see American weakness," Kudlow said. "[Trudeau] can't put Trump in a position of being weak going into the North Korean talks with Kim. He can't do that." While other presidents and prime ministers have had testy relations — president Richard Nixon famously used a profane word, behind closed doors, to refer to Trudeau's father Pierre Trudeau, also in the context of trade talks — neither side has demonstrated this level of animosity since John Diefenbaker feuded with John F. Kennedy in the early 1960s. After Kudlow's comments, Trump added to his string of criticisms against Canada in a series of tweets on Sunday night. "Fair Trade is now to be called Fool Trade if it is not Reciprocal," he tweeted. "According to a Canada release, they make almost 100 Billion Dollars in Trade with U.S. (guess they were bragging and got caught!). Minimum is 17B. Tax Dairy from us at 270%. Then Justin acts hurt when called out!" He also asked why he should allow countries to amass "Massive Trade Surpluses, as they have for decades, while our Farmers, Workers & Taxpayers have such a big and unfair price to pay? Not fair to the PEOPLE of America!" He cited "a $800 Billion Trade Deficit" for the U.S., a number he's touted several times. Trump says the U.S. "protects Europe" and "pays close to the entire cost of NATO." The president concluded his tweetstorm by saying, "Sorry, we cannot let our friends, or enemies, take advantage of us on Trade anymore. We must put the American worker first!"